Each of our One Word card display sets contains 13 different words, verses, and thoughts related to the title theme, with a variety of art backgrounds. The stationery sets have 8 different words & art backgrounds. Some time ago I (Susan) realized how easy it was for me to awaken in the morning and become discouraged as I thought about my day. Even after a time of prayer or studying the scriptures it was easy to dive into the day’s responsibilities unaware of His continual presence and intimate involvement in my life. It was easy to let my concerns of the moment become bigger in my head than God. What I needed was a bigger vision of our great God and a simple way to nurture this vision. To change my pattern of thinking each morning, I began to ask the Holy Spirit to remind me of ONE character trait of Jesus or God to think about throughout this day (John 14:26). This simple habit has changed my life. Susan began using the character traits, verses, and prayers she compiled to bless others through a weekly email with One Word, One Verse, and One Thought. 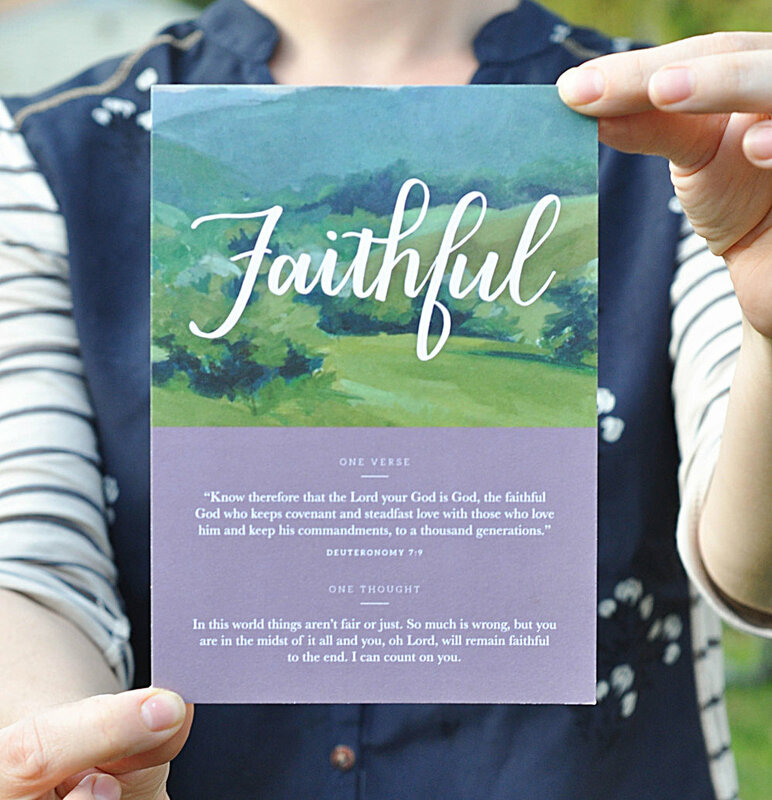 To display these mini-devotionals, she enlisted the help of Jess Blanchard, a graphic designer and artist, and Susan's daughter-in-law Christy Yates, a fine artist specializing in landscape paintings. The combination of Susan's content, Jess's calligraphy, and Christy's paintings produced such a beautiful result that many people began asking to be able to purchase the One Words as printed cards. So, as a team, we made that happen! We compiled the cards into six sets, each with a different theme: Strength, Hope, Comfort, Peace, Joy, and Wisdom. Each word in the 13-card set relates to that theme. We also now offer two sets of 8 folded notecards with envelopes! Our hope is that you will display the easel in your home in a favorite spot and replace the card weekly so that you can keep a character trait of God in your mind and dwell on it throughout each day. We sincerely desire for these cards to help nurture a bigger vision of God in your own life. The cards also make a great gift so that you can encourage others in your life in their walk with God. Is a friend going through a difficult time? Perhaps the Comfort cards can bring a reminder of God's presence with them. Or, use a single card as a postcard -- choose a word that would encourage a loved one, jot a note and their address on the back, and pop it in the mail (with a stamp, of course! ).